David Nugent's winner strengthened Leicester City's promotion hopes as Wolverhampton Wanderers suffered a fifth defeat in seven league games. Anthony Knockaert put the hosts ahead after running unchallenged before hitting his eighth goal of the season. Wolves looked set for a hard-earned point when Bakary Sako levelled with an excellent finish from 20 yards. But Leicester secured victory thanks to Nugent's finish from just outside the area after sloppy Wolves defending. Nigel Pearson's side move three points clear of third-placed Hull City and seven points behind leaders Cardiff City having played one game more. In contrast, Wolves are just five points above the relegation zone and without a win since Dean Saunders took charge earlier this month. The worry for Saunders will be the way his side conceded so easily. Knockaert opened the scoring in the 24th minute, the Frenchman rifling into the roof of the net after being allowed to run unchallenged into the area. Wolves levelled through the goal of the night from Sako as the 24-year-old unleashed an unstoppable 51st minute effort. Nugent's winner came 17 minutes from time, the former Portsmouth striker again allowed to run unchallenged before hitting the target. Wolves were denied an equaliser when Sylvan Ebanks-Blake hit the post in stoppage time. "I will be the first to admit we have played better. 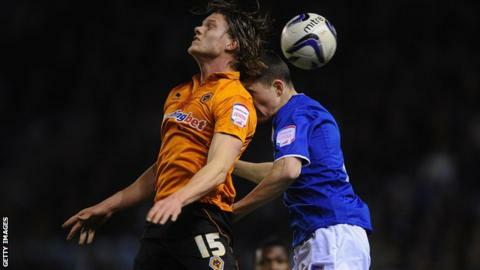 But credit to Wolves, who played with a lot of spirit and made life difficult for us with five in midfield. "So it was nice to win a tight game like this with two bits of quality. The irony is that we scored our goals on the counter-attack and in the second half we really had to grind it out. "It was a calculated risk to play Knockaert because he had had an ankle injury. But he worked very hard for the side in both directions. I was very pleased with his contribution." "I thought we played well but missed our chances. We had at least 10 clear cut chances and then got done twice on the counter attack. "For the first goal we backed off and let the lad get into the six-yard box. It was not the best defending but when you lose as many games as we have done you lose belief. "I think we became over confident and we should have stopped Nugent right where he picked up the ball on the half way line."